Under the veil of darkness, I saw little more than a hulking presence that towered in the distance. Our flashlights illuminated small details along the path: heavily worn steps, the edges of a gateway, and then a bell-shaped, perforated stupa. I had arrived with Bama, my longtime travel companion, and fellow bloggers Bart and Badai. 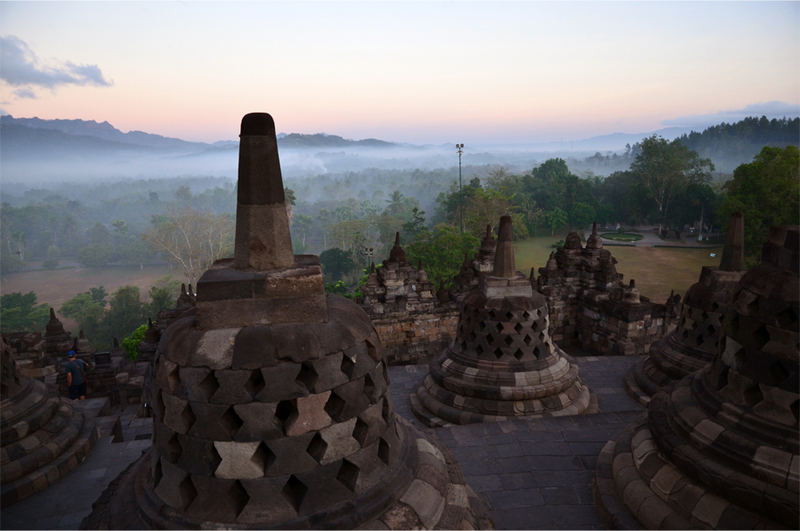 All of us were repeat visitors to Borobudur, but none had yet witnessed the glory of a new day from its terraces. The four of us sat on a ledge, awaiting the dawn with a small crowd of spectators. In time the sun rose over the slender cone of Merapi, Indonesia’s most active volcano, and its dormant neighbour Merbabu. Beneath a boundless sky bathed in pink and flaming orange, our surroundings gradually took shape. From this colossal mandala encrusted with spires, archways and elaborate bas-reliefs, I looked out in awe as the mist burned off the forest, the nearby hills and palm-fringed fields. 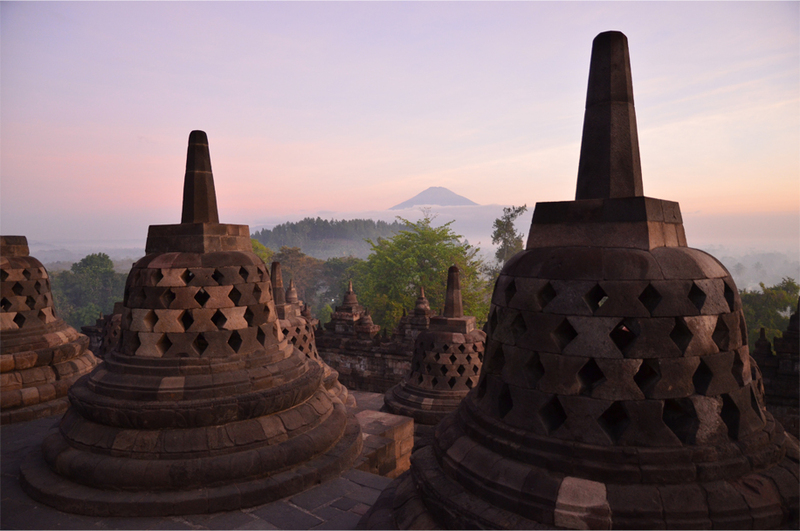 To visit Borobudur a second time, nearly twenty years later, was to see it with new eyes. Much has changed since those days. Indonesia is no longer led by a corrupt military dictator, but a humble, democratically elected ‘metalhead of state’. 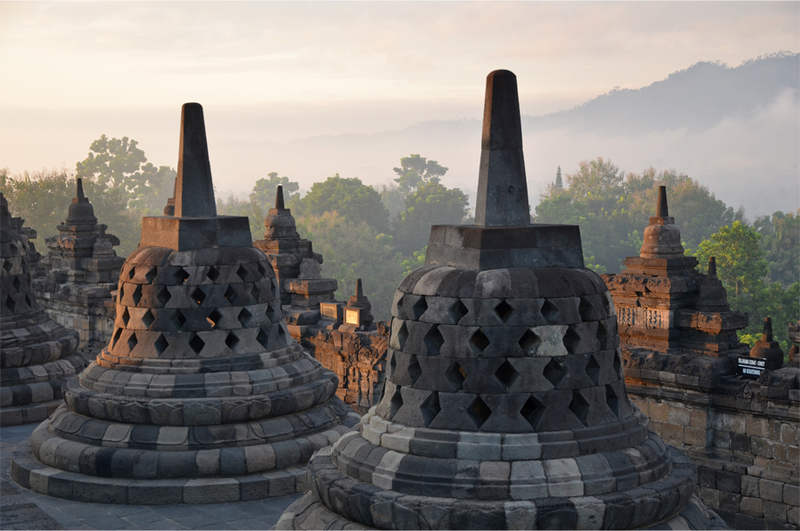 I am no longer a ten-year-old wishing to be an architect, but Borobudur inspires the same feelings of reverence and wonder. Now that I am older, it strikes me as being even more magnificent than I had ever recalled. 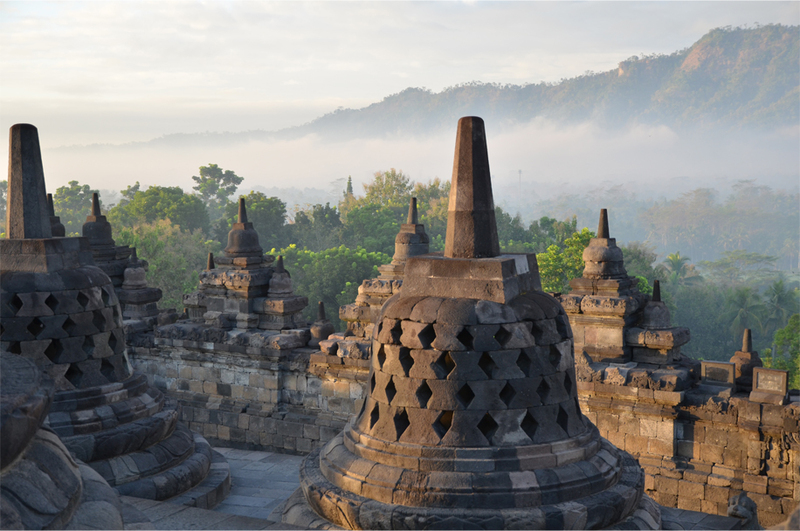 More than a thousand years after it was completed (around 825 AD), Borobudur remains the world’s largest Buddhist temple. 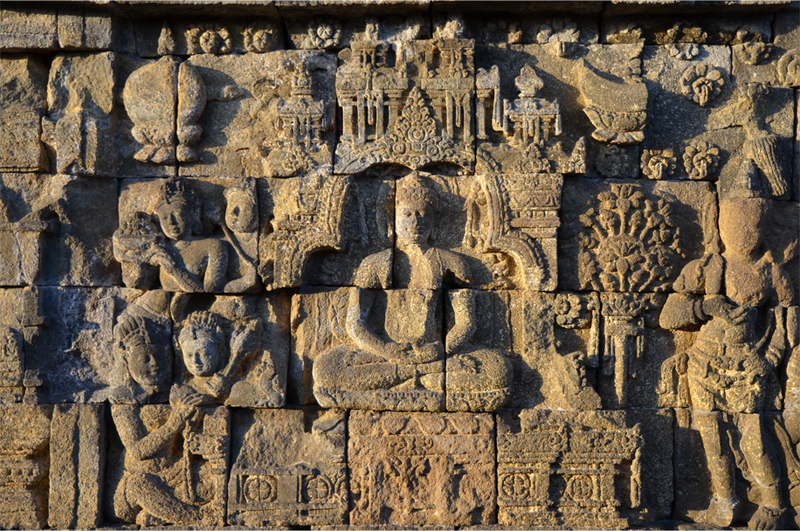 The structure is adorned with 504 Buddha statues and more than 2,600 individual bas-reliefs, depicting the biography of the Buddha, his former lives, and everyday scenes in eighth-century Java. 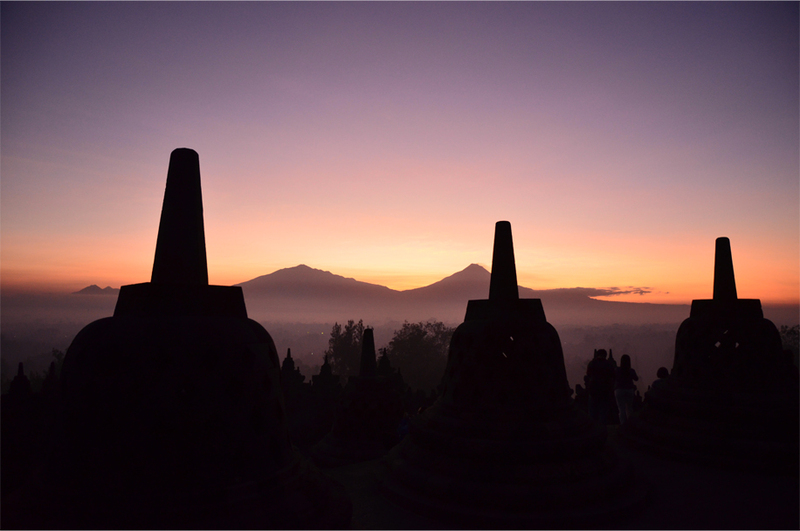 Today Borobudur is still used for its original function; once a year, thousands of monks and pilgrims converge on the monument to celebrate Vesak, commemorating the birth, enlightenment and death of Gautama Buddha. 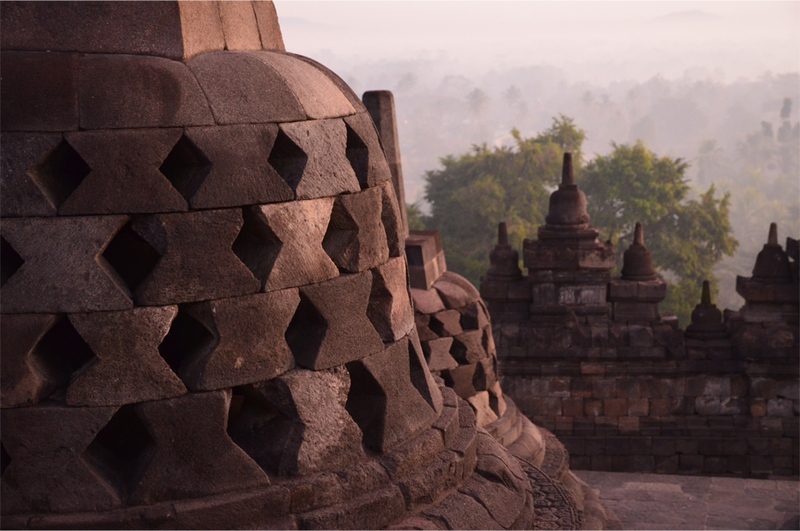 Buddhists and Hindus believe in samsara, an endless cycle of rebirth, and Borobudur has undergone a physical rebirth of its own. Motivated by the threat of collapse, conservationists dismantled it stone by stone between 1975 and 1982 in a large-scale restoration. Each block was meticulously catalogued and cleaned, the foundation stabilised, and a modern drainage system installed. By the early nineties, after the renovation was complete, the temple was inscribed as a UNESCO World Heritage Site. 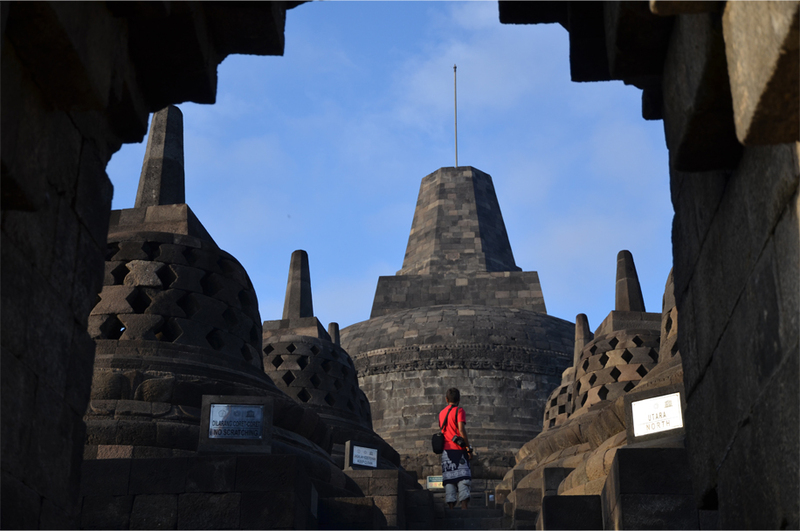 But Borobudur wasn’t always as celebrated. For centuries the monument lay hidden and overgrown, neglected under layers of volcanic ash from nearby Merapi. 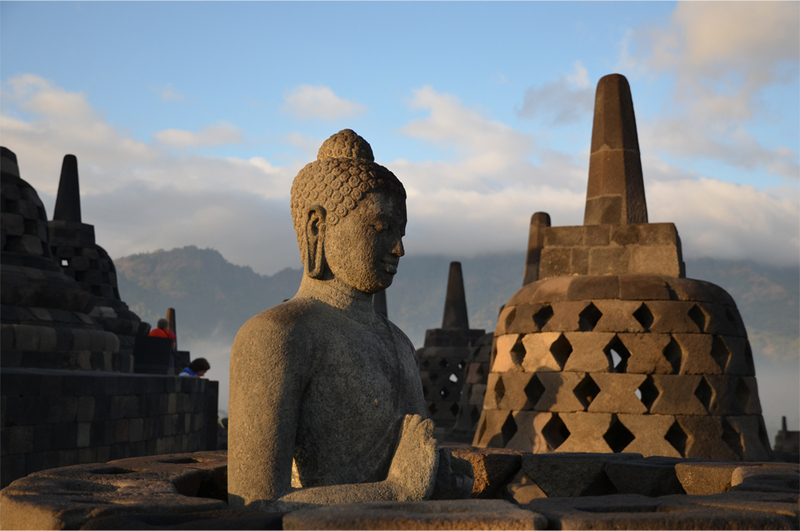 In 1814, during a brief period when the British ruled Java, it was Sir Thomas Stamford Raffles who brought Borobudur to the world’s attention. 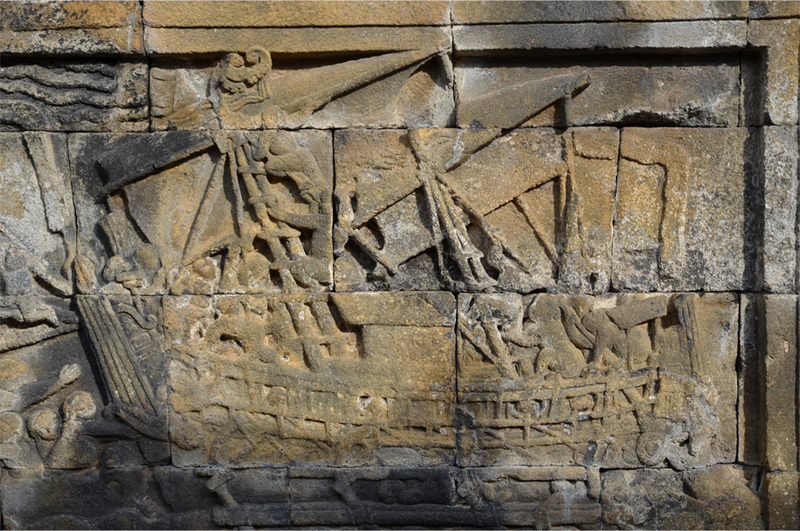 The governor had heard of a great monument that lay deep in the jungle of Central Java, and he tasked a Dutch engineer, H.C. Cornelius, to excavate the site. It took two months to remove the earth and hundreds of trees obscuring the temple, before its faded glory was finally revealed. Wonderful post James, and superb photos. 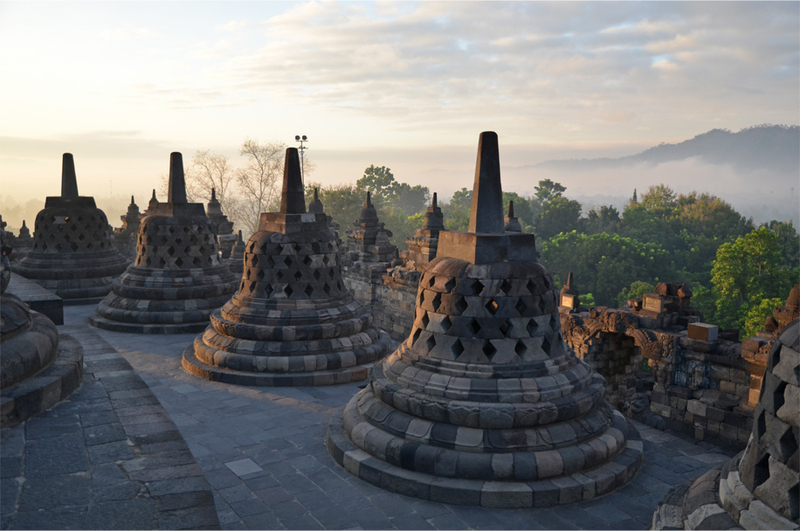 I hope we get to Borobudur one day. It looks magnificent. Thank you, Alison. I think you would both appreciate its enduring beauty. The combination of majestic architecture and spirituality – not to mention the solitude of a tropical sunrise – is totally compelling. 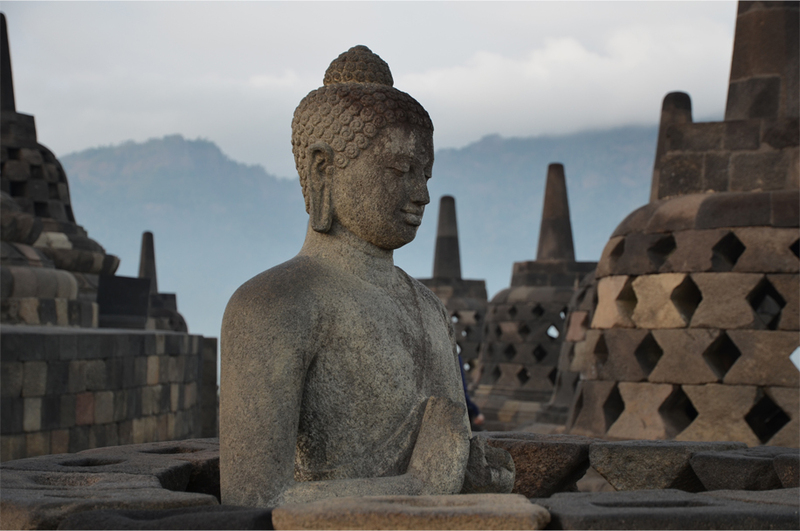 As a repeat visitor, it was one of the best time in Borobudur I’ve ever had James. 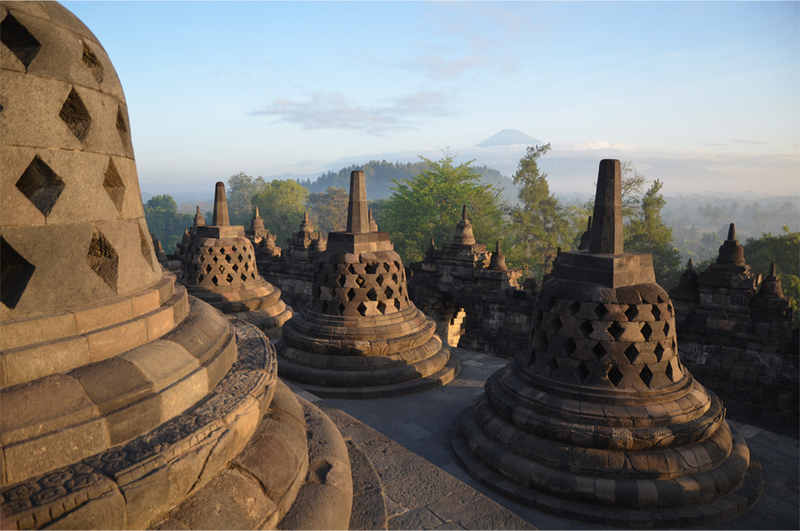 My long time wish came true, enjoying the sun rose over Borobudur! Very good article and photos James. As usual I always enjoy to read your writing, it flows gently. I’m glad to hear it, Bart. It was a picture-perfect sunrise for sure. Considering how cloudy it got later that morning, we really lucked out with the weather. Makasih banyak for the kind words! Salamat Enrico. 🙂 The experience is a must – particularly if you want to avoid the midday crowds! If I remember it right, last year’s visit was my fifth. 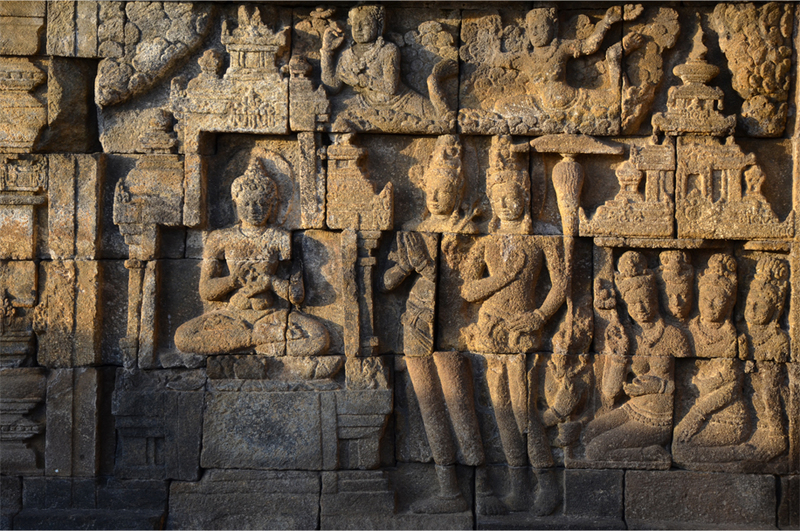 Yet every time I return to Borobudur, I am always astonished by its sheer size and intricate carvings. 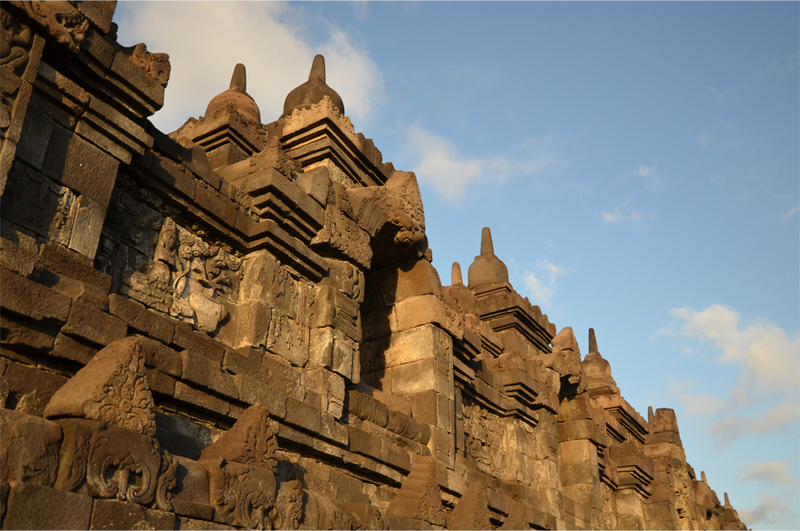 It’s also fascinating to think how much temple-building technique had evolved in ancient Java, from modest Hindu temples in Dieng to a colossal stepped pyramid that is Borobudur. Superb photos, James! 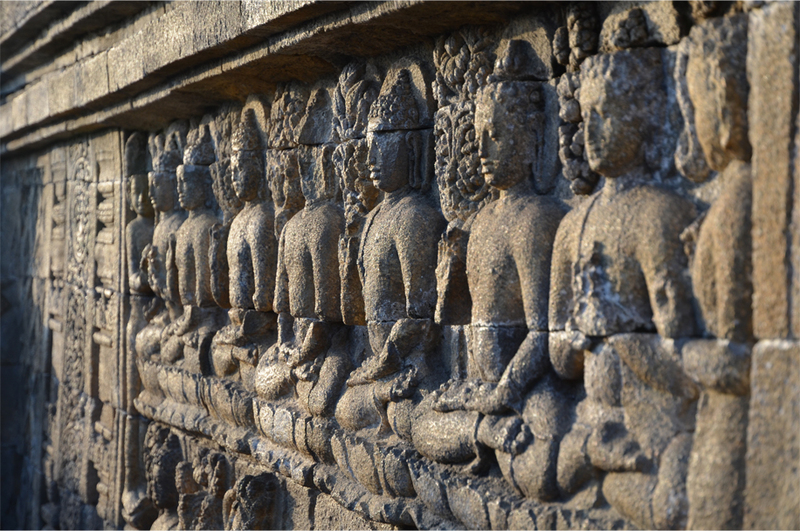 We must have spent at least four hours at Borobudur… and it still feels like I only explored a fraction of the temple, or at least seen a small portion of its exquisite carvings. It was overwhelming in its beauty. I’m sure I will return someday in the future. Makasih, Bama! Was here in 1990 always remembered the high pitched sounds of the cicades continuously piercing out ears! 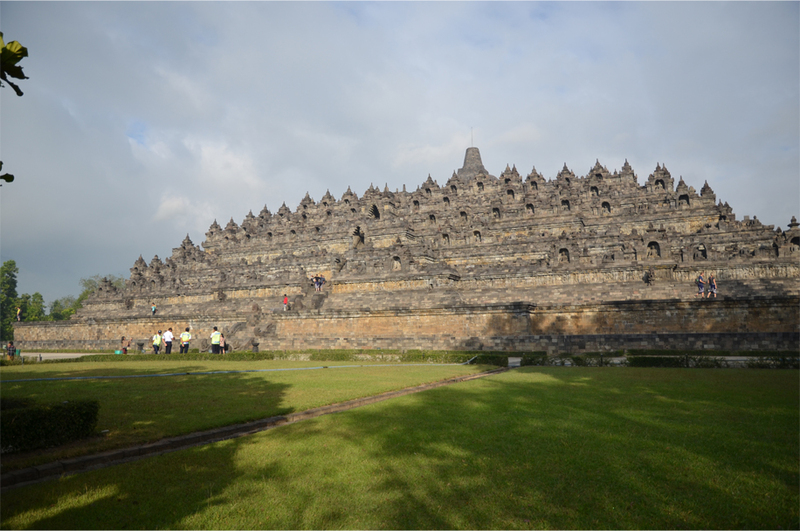 AL Prambanan was also a wonderful site to visit too! Wow, 1990! 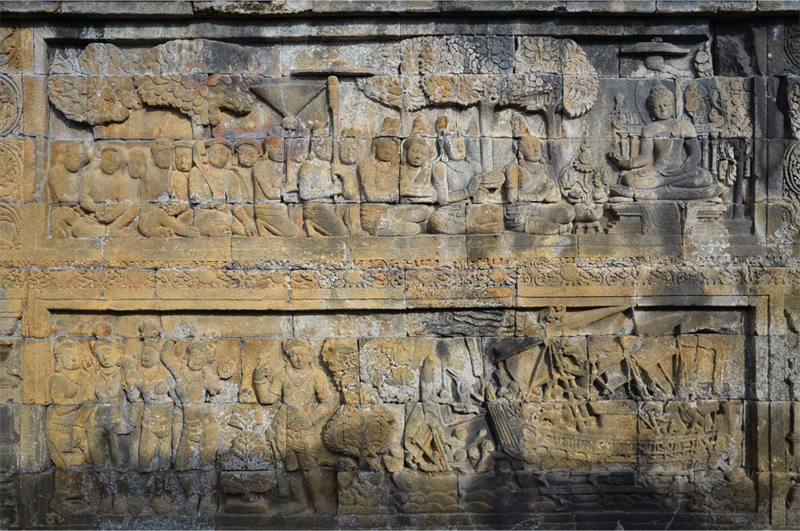 I imagine Borobudur wasn’t quite as popular for foreign or Indonesian tourists back then. Funny as I don’t recall hearing any cicadas… they must have been fast asleep! Probably a seasonal think perhaps? Absolutely. You have to see it for yourself! Stunning photos! Wish I was there. 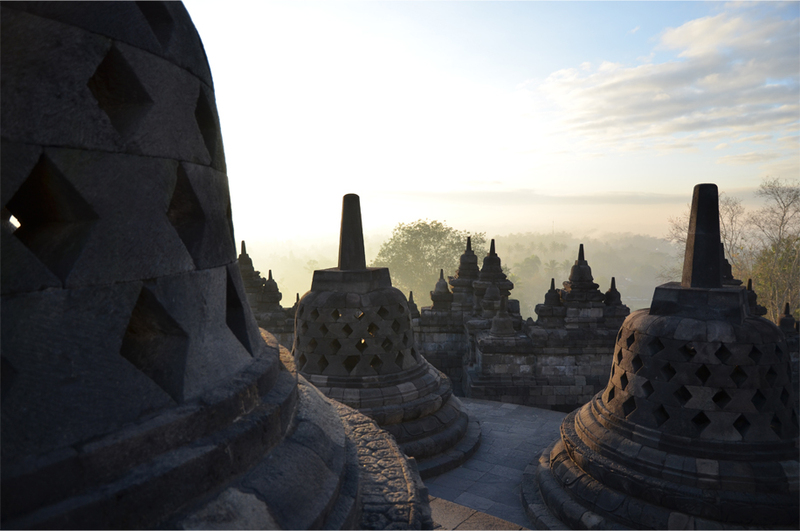 Thanks for reading – Borobudur is a true wonder of the world. Absolutely stunning photos, James! 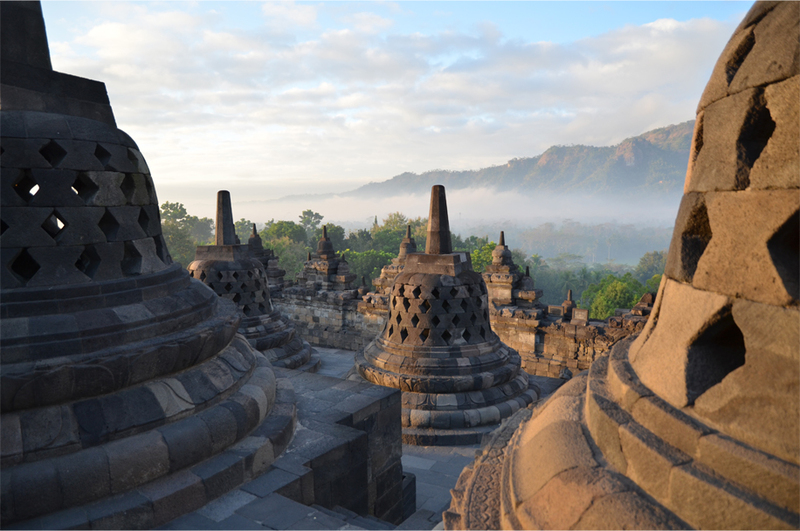 The light on the stupas and the mist floating behind are magical. I scrolled back and forth many times to see the images again. The history is fascinating as well. When oh when am I going to get to all these places I want to see with my own eyes?! Thanks, Lex! “Magical” was a word that kept cropping up as I wrote this post, though I didn’t use it because I wanted the pictures to speak for themselves. The mist added such an ethereal quality to the place – it felt like being on a holy mountain. Fingers crossed you’ll make it to Indonesia soon! Wow! Can’t think of anything else to say as dawn fills the sky with blue light outside my home office window. 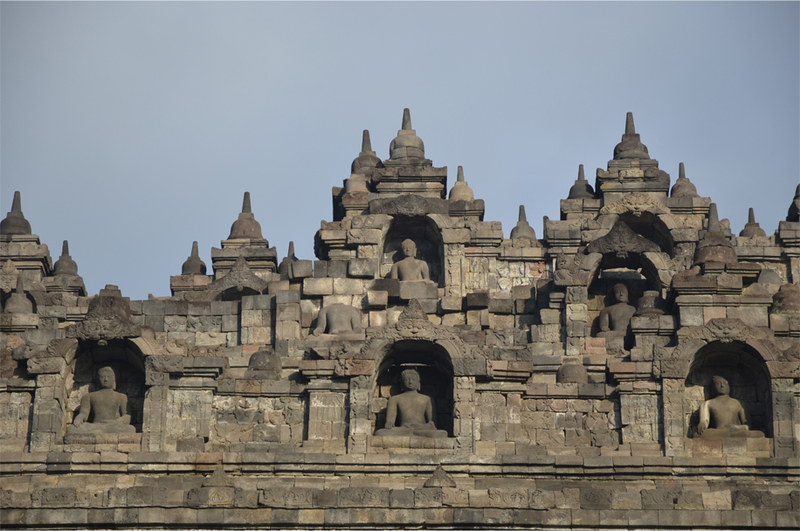 During America’s craziest and most disturbing presidential election yet, there’s a lesson to learn from Borobudur’s history. Crazy and disturbing is right – we have been following the developments very closely here in Asia. It is alarming to see just how popular that motor-mouth billionaire has become. Absolutely stunning photographs and descriptions. I love the morning meditation photo particularly. Thank you, Peta. 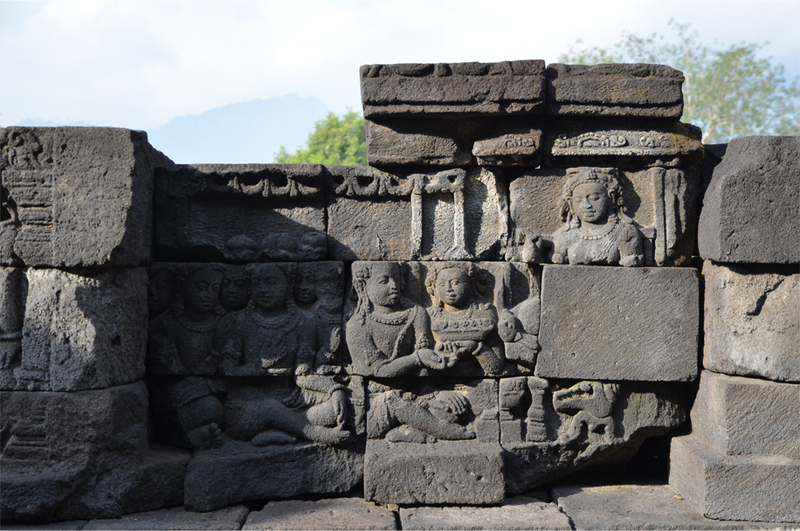 It is incredible to think that those sculptures have survived over a thousand years of wind and rain, volcanic eruptions, creeping tree roots and neglect. We are so fortunate to see them in such good condition. I didn’t know the whole structure had been pulled apart stone by stone. A wonderful piece which brought back memories of my 1989 trip when I took my nine year old daughter who wasn’t a bit interested. She wanted to get to the markets below. It’s mind-boggling, isn’t it? To think that they dismantled more than a million stones and put them all back together again. Has your daughter ever gone back a second time? No. We spent about seven weeks in Indonesia so saw a good chunk of Java and Sumatra. She’s only been back to Bali. Great photos. Lovely time of the day too. Wonderful sequence of the light brightening over the stupas. Thanks! I was a bit concerned that some might be put off by the number of photos with stupas in them, but as you mentioned, it was all about capturing the changing light. I didn’t know that it had been covered in ash and foliage. That is pretty amazing that it was forgotten about for so long. You have some really beautiful photos, by the way. I can just imagine the faces of the guys who dug out Borobudur… it’s not every day you get to recover an ancient temple from the the jungle! Thanks so much, Jeff. That’s a big compliment, coming from a gifted photographer like you! No kidding. A lot of the temples in Mexico are the same way – the jungle took them over. 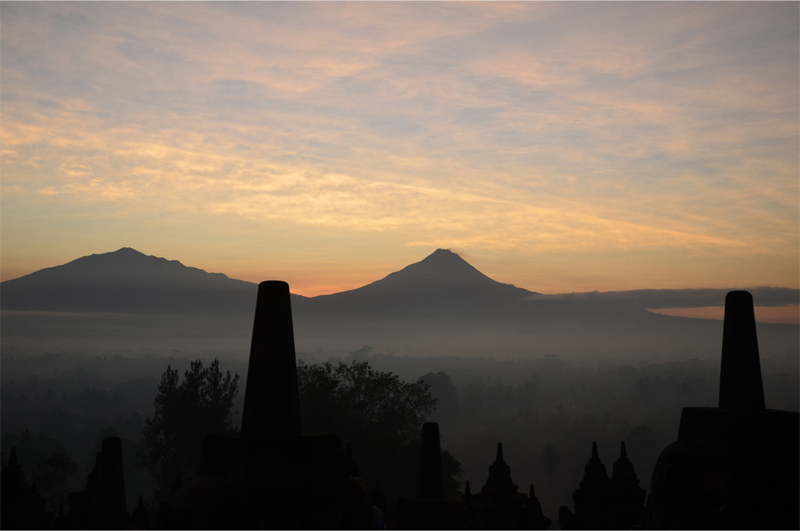 I think you had a prettier sunrise, but Mark Zuckerburg was at Borobudur at sunrise when we were there, so, there is that. Did you take a selfie with him? Pics or it didn’t happen. Much appreciated, Nandini! 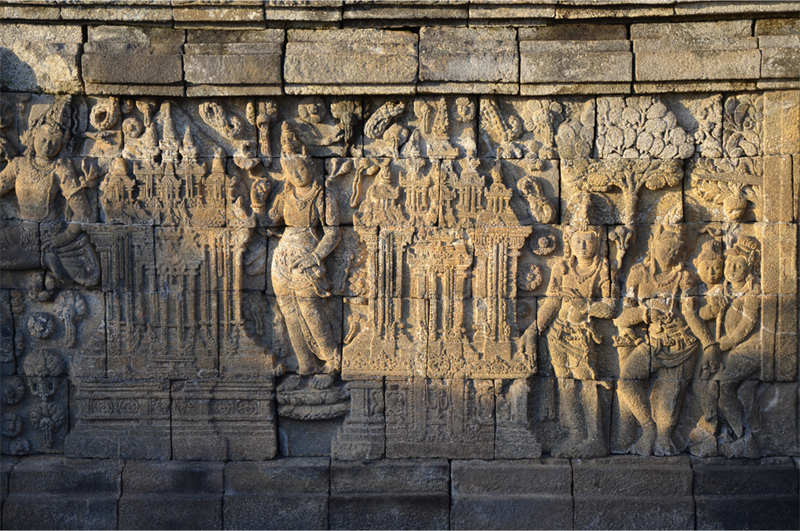 🙂 If you ever get to Borobudur, I think you would see some strong Indian influences in its bas-reliefs. James I don’t think I have adequate words to describe the beauty of those photos at sunrise. they make me want to leap on a plane as well as take photography classes. Thanks Sue – I’m glad the pictures inspired such feelings in you. Their beauty has less to do with skill and more with being there at just the right time! Spectacular photographs. Might be the best you have shared. Wow, that’s a major compliment right there. Thanks so much! 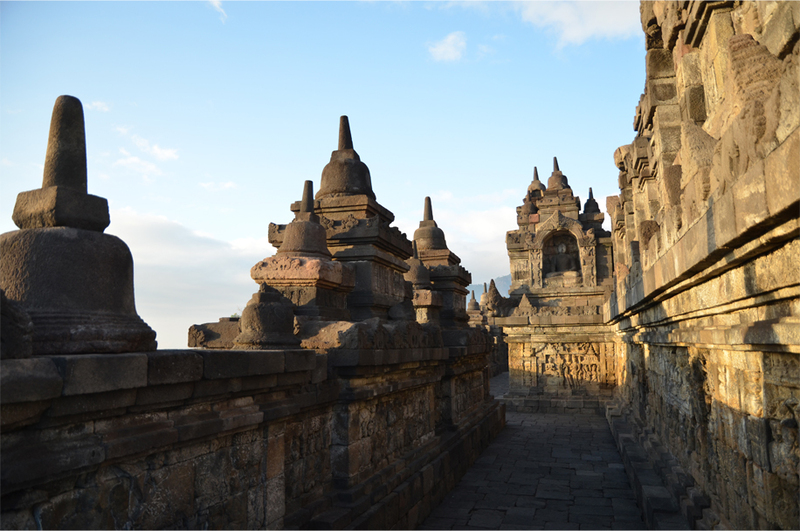 As you said, Borobudur is a place to revisit again and again. Although I would rather not go at midday with the crowds and the harsh sunlight bleaching out my photos. The night-time dance performance sounds magical – I’d love to see it. This was, truly, just beautiful. Much appreciated – thank you for reading and commenting. James…well, brilliant, as usual. But this post seems extra-brilliant for some reason. Obviously the photos are stunningly awesome (and I never use the word “awesome”). But your writing in this post seems so…I don’t know…mature. I was amazed that Raffles found the place…what a guy that dude was. Have you seen his hotel in Singapore (joking). I also didn’t know it had been so hidden. And now I’m wondering where all the foliage went, because when I was there, I don’t remember much foliage around the place? And I wanted to see it early in the morning, so stayed right nearby…before the tourist buses arrived! 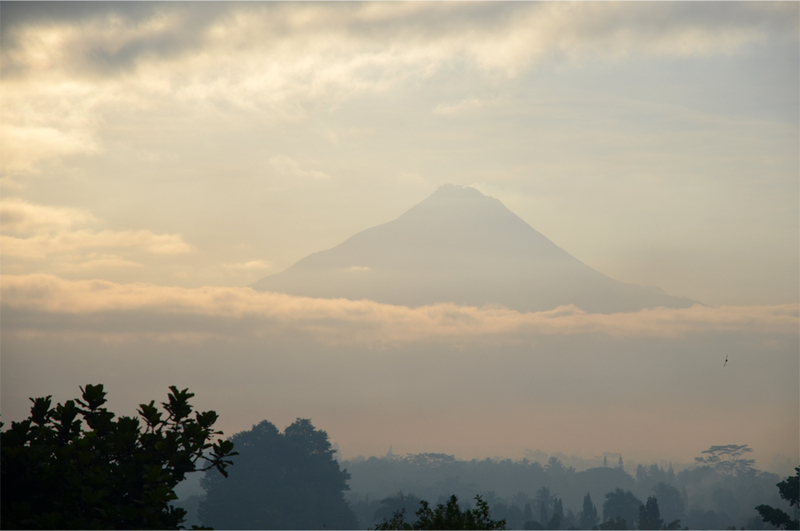 Merapi was emitting a bit of smoke (which, I guess, isn’t unusual), but made for good photos. You and Bama make a great team…love reading both your takes on places you go! Thanks so much, Badfish – you are too kind! Well, I think most people know Raffles for his hotel in Singapore (and two statues down by the riverbank). Also the huge, foul-smelling flower that carries his name. The foliage was already cleared by the 1870s – there are a couple old photos from that period showing the temple sans jungle growth. Gorgeous, love this place! Great photos. It was an incredible experience. Thanks for dropping by! 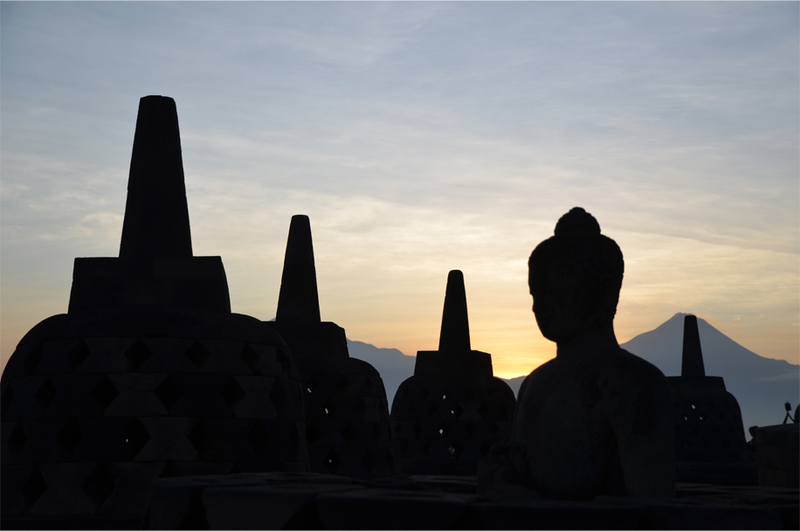 I couldn’t agree more – Borobudur is such a masterpiece. Beautiful photos! The mist really adds something to the photos.